In the Muromachi period(1334-1555), bamboo works (mainly flower baskets) were brought to Japan from China as part of the appreciation of tea. With the growth in the popularity of the sencha tea ceremony from late in the Edo era through the end of the Meiji Period, karamono (meaning "baskets from China") were highly valued as representing the Chinese aspects of a tea ceremony which was still strongly influenced by Chinese style. Baskets newly made were generally karamono utsushi ("copies of Chinese baskets"), however as time passed and the skills of the kagoshii ("bamboo basket makers") and their patrons' purses grew, the kagoshi started making "made in Japan Chinese baskets" with references to the Chinese origins but with ever stronger Japanese accents, with some artists, particularly those in the Kansai and Kanto areas, eventually adding their signatures to their works. The Iizuka family of Tochigi prefecture was one such family of artists. [When the Taisho emperor succeeded to the throne in 1914, The Iizuka family was commissioned by the Imperial Household Office to make Shinpuku iriemekago. (�_•ž“ü–ÚâÄ)]. In the picture, they are making one pair of Shinpuku iremekago for the celebration. 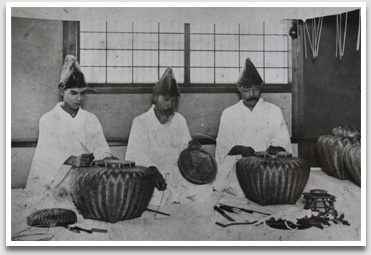 In the Taisho era (1914-1925), bamboo works were not considered as 'craft arts' as they are now. Instead, the common perception was that bamboo works were like �gbamboo ware�h, and the material and therefore the works were considered to be less important and less worthy of respect than other types of crafts. With their superlative technique, Hosai II and Rokansai worked to position bamboo craft art firmly as a member among equals in the world of Japanese craft art. Building on the success of his forebears, Shokansai pursued the development of bamboo craft at an ever higher level through the Showa period and into the Heisei Period.